contexts and application – and never in isolation. A BBC article about UK minimum wage increases provides us with a perfect example of why we do this. Personal finance reporter, Kevin Peachey, uses percentages to discuss wage increases and inflation in the UK, and comparative annual wages on a global level. However, while percentages are a nice way to present boring data to the layperson, it’s also a way to hide important information – whether intentionally or otherwise. On the surface, it can seem that the Apprentices get a pretty sweet deal since they have the highest increase of 5.4%. But, as we ask of our students, “5.4% of what?” In reality, it’s 5.4% of a measly amount of just £3.70. The BBC provides one key number, 4.9%. 4.9% is the percentage increase exclusively for people aged 25 or over. What’s missing here? Quite a lot actually! Firstly, where are the comparative percentage increases for the remaining categories? With the additional percentages provided, this would allow for a comparison of the rate increases. At Pear Tree, our students calculate their own percentages from real life data in order to be able to present statistics in an palatable manner. Is this enough, though? Well, no, because on the surface, it can seem that the Apprentices get a pretty sweet deal since they have the highest increase of 5.4%. As we can see, even though over 25 year olds don’t quite have the highest percentage increase, because their hourly rate is the highest, they easily get the highest overall pay increase. Without even this level of understanding of applied math, it can really easy for students to be blinded by percentages / statistics, which can disguise the truth. Another thing that we would expect students to notice is the increasing pay gap by age and the effect this has on hiring decisions by businesses. It becomes even more profitable to hire younger employees at minimum wage. 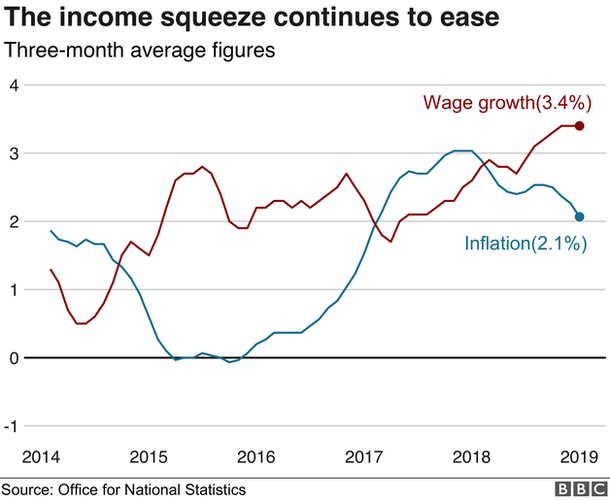 The same problem with percentages arises with the comparison graph between wage growth increases and inflation (see above graph from the BBC). From this graph, it looks like this is a great time for wage earners: wages have increased, inflation has gone done. If your average weekly wage (which isn’t fixed, because it depends how many hours you work) in 2018 was £313.20 (for 40 hours), your monthly pay would be about £1,253. A 4.9% increase would bring that figure to £1,313.60 for an overall increase of £60.60 for the entire month. Imagine that your cost of living increases by – a mere – 2.1%. If you’re living pay cheque to pay cheque, as most Vancouverites are, you were spending £1250 per month. Now, your cost of living would be £1,276.25, and you would be about £37 better off. But that’s 2.1% more on the same amount of money. If the original amount was higher, such as the cost of a car, holiday, house, etc., that is 2.1% on a lot more money, which has a more dramatic impact. Students at Pear Tree Elementary constantly learn math in context so that math is more practical, more interesting, but also much more challenging. They aren’t blinded by statistics, but are taught how to analyse data to find the truth. At the same time, they are taught how to present data in a statistical manner and by creating their own infographics. If you’re interested in finding out more about Pear Tree for your child, sign up for our next open house.